Strugging with truth tables? I made this app just for you - quickly generate truth tables from any boolean logic statement - it also includes an interactive tutor that teaches you how to solve truth tables step-by-step! 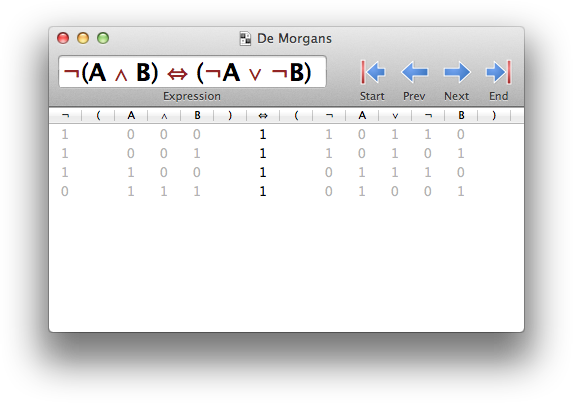 This truth table generator can show you the results of boolean logic statements quickly. Operators in order of evaluation. All identifiers must be uppercase. ~ Takes one postfix argument. True if the arugment is false, and false if the argument is true. + Takes two arguments. True if exactly one of the arguments is true, false otherwise. & Takes two arguments. True if both of the arguments are true, false otherwise. | Takes two arguments. True if either of the are true, false otherwise. -> Takes two arguments. False, if and only if the first term is true, and the second term is false. <-> Takes two arguments. True if both arguments are the same, false otherwise. / Splits an expression, so that multiple expressions can be entered. This truth table generator is written in ruby by Samuel Williams. It uses a unique parsing algorithm which supports arbitrary complexity operators, precedence and runs in linear time.